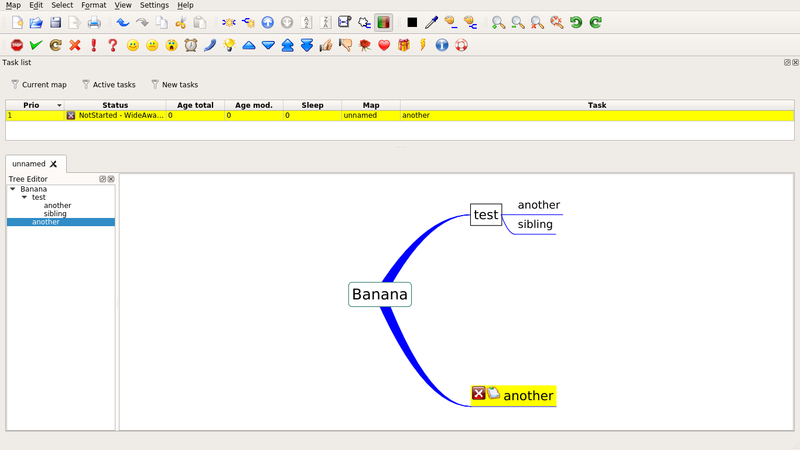 map is hierarchical and shows relationships among pieces of the whole. directly to the central concept, and other ideas branch out from those. spider diagram. A similar concept in the 1970s was "idea sun bursting". Linking ideas together, creating relations between them. and that is the perfect solution. specific purpose until stark, a nixers forum member, pointed this to me. what is there to know about them. When it opens it presents a list of the previously worked on mind maps. There are no other options than opening an old one or creating a new. The UI is straightforward, nothing fancy. You only have boxes linked together by lines. for it, ESC, and that's it. You can link and unlink thoughts using ctrl-L.
You can only export the project as a PNG image or as a labyrinth project. all the box don't seem to have any hierarchy built-in. vym has a complex but straightforward UI. a node on the same branch. It follow a tree structure and this shows by the way everything is presented. are thiner as you go deeper within the tree. nodes: NotStarted, WIP, Finished. It has a view dedicated for this purpose. inner cycles in it - And that's what I was looking for. than labyrinth is still blunt. vym is good for organizing tasks, that's what I would recommend it for. XMind is a proprietary software. > This software is not licensed. Enter License Key to activate XMind Pro/Plus. It bugs you about signing up and entering license keys. Nothing seems to work without it. I wouldn't recommend a non-free software. You can right click node to edit them or left click to select. as a node on the same branch. In the same manner vym did. children nodes. However here you got more flexibility with styling. It's also easier than vym to move the nodes around. One thing that is particularly nice with freemind is the export to HTML. applied directly from the software. is that you can add an anchor url to the nodes. Unlike vym, it doesn't support exporting to a text format such as markdown. nodes and link them to others. It doesn't let you have cycles within the graph. ideas are tree-shaped then this is the absolute goto. Freeplane is my personal favorite between the previous alternatives. 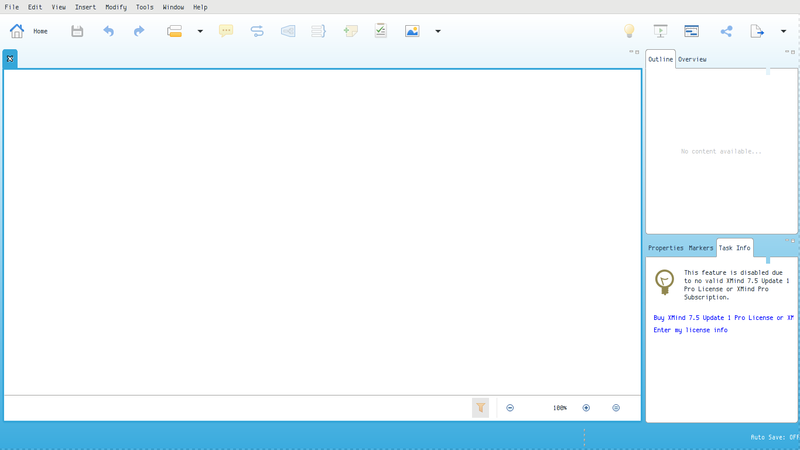 It starts with a clutter free UI, even more than freemind. It actually started as a fork of freemind. floating nodes and linking nodes from different parents. The styling is also more advanced letting you run wild with your imagination. And just like freemind, it let's you edit the HTML parts. Every format possible, from pdf, html, to dynamic html, to svg, to ascii. a node moving them will also move other children so that they don't overlap. allow floating nodes and doesn't restrict the tree hierarchy. 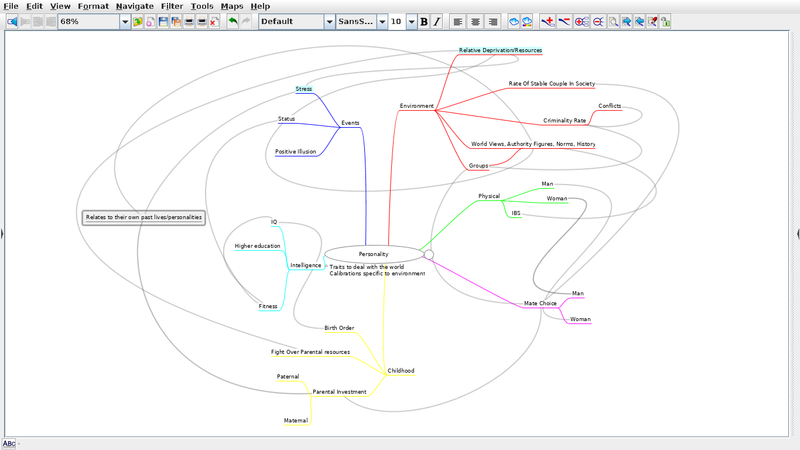 This is it folks, give mind maps a try! and then releasing the mouse. I will probably upload some images of code I read and worked on on paper. (15-11-2016, 05:45 AM)pranomostro Wrote: Thanks for the excellent write up! Just came across this thread. 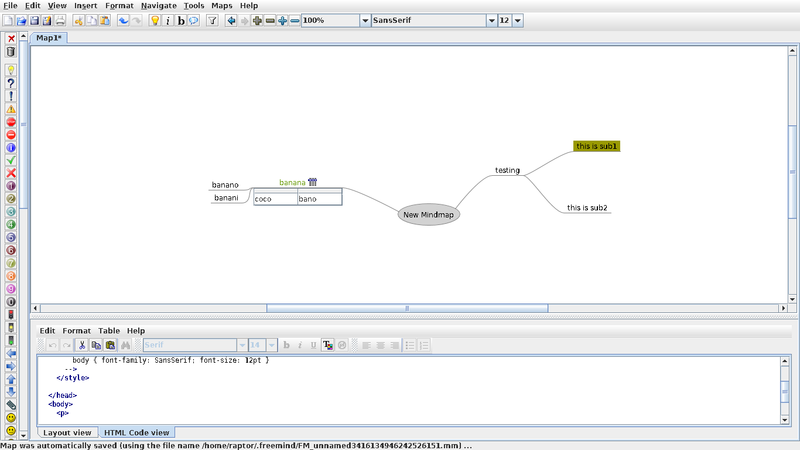 I know it's probably irrelevant to you now, but LibreOffice Draw can also be used for mind-mapping. I used it recently for a project on PageRank algorithm I'm working on and it was surprisingly easy to draw up complex networks. Labyrinth is no longer maintained and it's a shame. 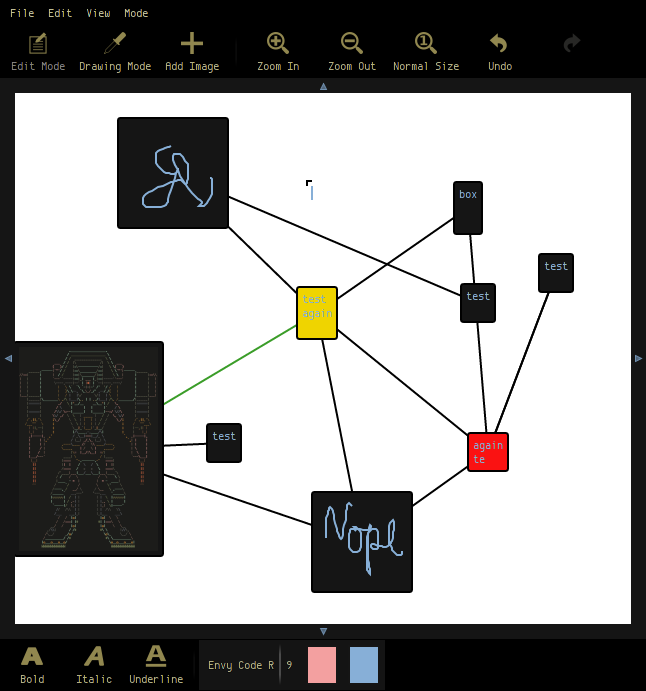 Still looking for a minimalist mindmap tool. I already use freemind, but i would like something more like Scapple. I would like nodes and link have properties, like a graph database. And why not the ability to add nodes from the terminal.